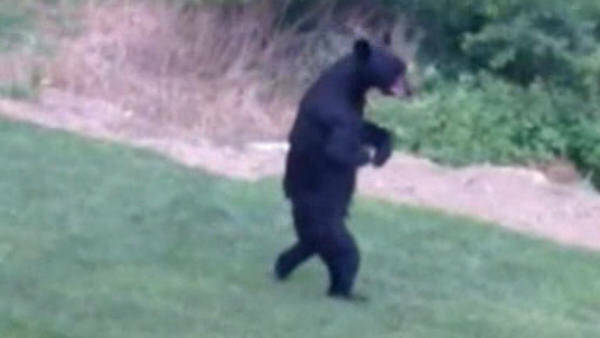 OAK RIDGE, New Jersey (WABC) -- New video shows "Pedals" the injured upright bear making its way through a yard in New Jersey this week. Joey Esposito posted this video to the Facebook page for "Pedals The Injured Bipedal Bear"
Esposito said he shot the video on June 20, 2016. The bear, which walks on its hind legs, hasn't been seen for months since it was first spotted in the Oak Ridge area. It is missing a front paw and the other paw is permanently injured -- so it's forced to walk upright, which is considered bi-pedal. The human-like walk of the bear had many people in the area initially wondering if it was a person in a bear costume. A fundraiser was started to help get the bear help, but wildlife officials disapproved of the move, saying the bear should stay right where it is.